Suspension/expulsion is commonly used in schools, yet these practices can adversely affect students’ education well-being and do not improve student behavior. 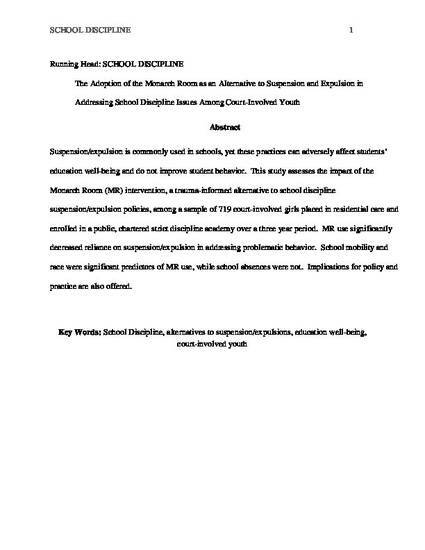 This study assesses the impact of the Monarch Room (MR) intervention, a trauma-informed alternative to school discipline suspension/expulsion policies, among a sample of 719 court-involved girls placed in residential care and enrolled in a public, chartered strict discipline academy over a three year period. MR use significantly decreased reliance on suspension/expulsion in addressing problematic behavior. School mobility and race were significant predictors of MR use, while school absences were not. Implications for policy and practice are also offered.